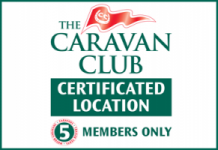 Here is a selection of the reviews from our previous guests listed on the Caravan Club Certified Location (CL) Website. Stayed here a week and thoroughly enjoyed ourselves. Friendly atmosphere all round. Price is £12.50p per night. Site very clean and well kept. Always ready for a chat, us and the residents, including the horses. Thanks for the holiday and chatting about form MG1’s mum! This was our first visit to a CL site so not sure what to expect. WOW, what a surprise Burnt Ash farm was. A good sized pitching paddock well maintained with a superb toilet block with roomy showers with lots of piping hot water, and kept immaculately clean. We received a warm welcome from Jeanne & Adrian and advise on how best to pitch up to make the most of the views. The dogs were well catered for with a couple of huge fields to stretch their legs. I found this to be a quiet site set well away from the road, yes there was the distant rumbling of vehicles passing over a cattle grid but it did not bother us. I would say a great spot to stay at a very good price if you are looking to explore Stroud, Cirencester or Gloucester. We visited the beginning of April 2015 and the weather was great, made it all the better to sit out and enjoy the surroundings watching the horses. I am sure we will be back. Visited this site end of April 2015.Simple with lovely clean toilet block, wet rooms, disabled, all heated. Bus stop takes you to Stroud. Lovely walk into Minchinhampton through gate dog loved freedom off lead. Market at Minchinhampton on Thursday AM all selling jams, cakes, veg excellent value as was local butcher. Well done Adrian & Jean hope to return this year. Interesting watching horses being trained in comfort of motorhome. We stayed for 3 nights at this site and would not hesitate to visit again. The welcome was warm and friendly with nothing being too much trouble. The site is a good size, very level and the grass lush and well maintained. There are lots of access points for drinking water and excellent recycling. The views are uninterrupted. There is a slight rumble from the cattle grids on the common – but it did not disturb our nights sleep (and we are used to total quiet) Having a 2 berth Tab caravan with no toilet/wash/shower facilities are important to us and they were great – scrupulously clean, really hot water, excellent showers. Lots of beautiful places to visit nearby. A great little site will visit again when in the area ? We have just come back from an extremely relaxing 3 night stay over half-term at this very welcoming CL. We have young children and they were encouraged to visit the stables and feed/pat the horses whenever they liked – Adrian was superb and let them sit on the tractors/diggers too! The toilet and shower facilities are second to none and an unusual treat for a CL. The area is idyllic with so much to do – we will definitely back for another visit. And as for the cattle-grid, it really was not a problem, to be honest you could hardly hear it! Chose this area due to family living nearby and wanting to visit them between Christmas and new year, plus close to Stroud, Gloucester and many other winter points of interest. We were greeted by the CL owners on arrival, shown to the well drained hard standing area (it rained every day for a week), helped by them to connect to the electric (free loan of extension cable due to touring field being a bit swampy), shown to washrooms & toilets (both up to at least CC site standards). Our kids really enjoyed the unlimited access to the stables and horses during our stay. Top marks to the staff and owners patience and their enthusiasm with our kids and their endless questions and requests to feed horses carrots and pet them! Rural site but with everything we needed – we love ‘proper’ CC sites and this CL was as comfortable but without the crowds. We can heartily recommend this site to anyone who wants to try CL camping but loves CC luxury. Great owners, good location, lovely farm style site. Give it a go!! PS – tv reception was fair to good, road network is good without feeling like you are living on the edge of a main road but the site is rural – pub within easy walk but supermarkets and proper towns a few miles away. Thats why we liked it so much! We stayed at the site in August 2013 (2 adults & 2 children aged 7 & 9). Owners are very welcoming and we were able to choose where we sited the caravan. The toilet and shower block was immaculate. There were 3 toilets and 2 wet rooms, I had not realised this from the owners website. Never a queue for the shower! Owners were happy for our children to visit the stables as often as they liked and help out. Children loved the freedom this gave them. Children also had a few riding lessons over the week – superb tuition. We visited Gatcombe Park for the eventing whilst we were there – site is very conveniently located for this, as well as for lots of other local attractions. Owner recommended a local park that we went to with the children which was uncrowded and idyllic. There is a very steep hill (with traffic lights at the top!) en route to the site – as others have commented, but not sure how this could be avoided. Can see others have also commented on the cattle grid – we didn’t think this noise was obtrusive at all. Would highly recommend the site, and hope to return. Thank you for a wonderful welcome. Stayed here for 4 nights and it was lovely. A nice friendly welcome, lots going on in the riding school, but nothing intruded into the site. Plenty going on. Bus stop at the end of the gated entrance. Wonderful shower block. Separate toilets and wet room facilities. Spotlessly clean. A good place to remember and call back. The directions to the site from Stroud up the steep hill could do with an update. On arrival a very warm welcome and an explanation as to where everything was located, water, waste, shower block etc. We could also use a large field to walk our dogs if we were not going over the common. The shower block is excellent, better than Caravan Club site facilities. The only down side to this location is a noisy cattle grid on the road outside the CL .The road is very busy and has a 40 mph speed limit on it, so you can imagine the noise from the cattle grid. A nice location to which we would recommend a visit. Our first CL – what a success! We have just spent the weekend here, a cold one! We arrived in thick fog after being held up by a nasty accident en route. The owner gave me his mobile number to text him nearer to arrival which meant I could let him know we were delayed. The entrance is just after the pub turn off but before the cattle grid when arriving from the Cirencester direction. The field itself was wet so we were on the hard standing, luckily we had a long hook up cable but we were offered one if ours was too short. This site is in a working livery so some coming and going but it didn’t disturb us. The gate gets locked each night so felt very secure. There is a cattle grid on the main road which does rumble but not so loud as to bother us, in fact initially we wondered what the noise was! The showers are absolutely fabulous, the best ever in a CL site. The first night we had our evening meal at The Ragged Cot, which serves dinner until 9.30pm. Lovely food, not “a la ping” which meant you paid a little more but it was worth the money. Take a torch to two to get there and back…..no footpath and very dark! Saturday was spent in Cirencester. A mix of chain shops and lovely independents too. The museum was fantastic and only £4.95 an adult to visit. We learnt more than one or two facts in here! The Beeches car park is a good one for motor homes if you park the back over the grass (sat nav GL7 1BN and a maximum cost of £3.40 for the day). Finally as we were the only fools to venture here on such a cold weekend we were told we could leave whenever we liked which meant an even longer lazier Sunday morning than usual! Excellent site, only minor issue was with the broken cattle grid on the public road approx 100 metres away which groaned every time a vehicle went by, the road was quite busy esp. early morning (07:00- 08:30) and later between 16:30 – 18:00. Best showers and loos we have encountered in 25+ years of camping/ motor homing. clean efficient and towels changed daily. Site is 600 feet above sea level and somewhat exposed to the west. There may be other suitable approaches for caravans other than the road from the east ( coming from Cirencester) but I did not find them, approach from Stroud OK in an Elddis 140 motor home but not with a caravan!